With temperatures in the Midlands set to hit their highest all year this week, how should you dress for the workplace to ensure you still look smart without overheating? Claudia Huxtable, senior fashion lecturer at Birmingham City University, shares her advice for dressing for the heat. Make the most of the sunshine by wearing bright colours and prints. Ladies - sandals are fine and will make your feet feel cooler. Gentlemen - sandals are not fine for the office! Wear natural fabrics - they help your body to breathe as they absorb moisture more effectively. Smart shorts are fine for both men and women, but do check the weather will be sunny all day to avoid getting caught in the rain. Wear shorts just above the knee, short shorts are a big no-no! Wear light colours as they reflect the sun and will make you feel cooler. Gentlemen, leave the ties at home as they'll make you feel constrained and a little hot and bothered. Loose clothing will help cool air to circulate around the body. Finally; unless you’re Kanye, only wear your shades outdoors. 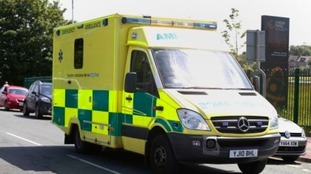 Health professionals are advising people to take extra care in hot weather.